Cochlear Implant Systems Market size was valued at over USD 1.4 billion in 2016 and is forecast to grow at over 8.5% CAGR from 2017 to 2024. Cochlear implant systems market is poised to witness lucrative growth over the forecast years. Growing incidence of hearing loss in both pediatric and adult population will drive industry growth. Profound deafness during childhood affects the development of auditory speech perception and speech production leading to a negative effect on education and employment opportunities for these children. Children receiving cochlear implants at a young age exhibit significant improvement in auditory perception skills. Growing elderly population base will further fuel device demand as these individuals are prone to suffer from age related hearing loss that significantly hampers their participation in day to day activities. Increasing government and non-government support, and initiatives will augment industry growth over the forecast years. Governments in several countries have implemented new born hearing screening programs for identifying babies suffering from hearing loss and guiding their families towards appropriate services and treatment options. Governments also provide financial aid to patients through various schemes. Non-government organizations such as Gift of Hearing Foundation and Cochlear Implant Awareness Foundation also provide support and guidance to patients. Lack of awareness pertaining to the implant systems among both, the general public and medical professionals in developing economies limits adoption. However, government and non-government programs and campaigns aimed at sensitizing the population regarding the benefits of cochlear implantation will boost uptake during the forecast years. 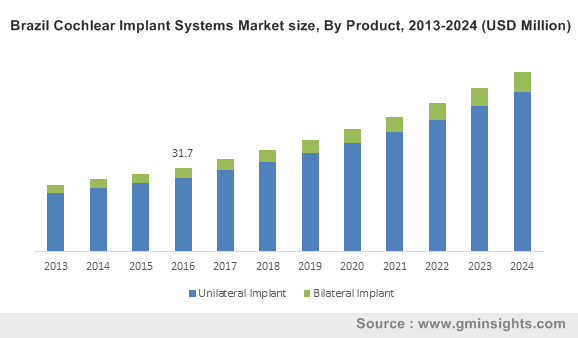 Unilateral implant industry segment held considerable industry share in 2016. Typically, individuals prefer unilateral implants owing to high costs of bilateral implantation and added surgery risks. Bilateral implant industry segment is slated to exhibit lucrative growth during the forecast years owing to increasing in number of individuals opting for implants in both ears. Bilateral implants provide additional speech perception and localization benefits to patients. However, the additional cost on the second implant restrains adoption. Adult business segment is poised to grow at a robust rate during the forecast timeframe. Increasing elderly population pool prone to age related hearing loss will drive segment growth. Adults often benefit immediately from the implantation procedure and continue to show improvements for about three months after the initial tuning sessions. Pediatric business segment held significant industry share in 2016. The segment is slated to witness lucrative growth over the forecast years owing to the implementation of new born hearing screening programs in several countries enabling the identification of profound hearing loss among infants. ENT specialists, audiologists and cochlear implant surgeons will stimulate demand during the forecast years. Availability of latest technologically advanced devices will further augment adoption rate. Brazil cochlear implant systems market is poised to witness lucrative growth over the forecast years. Increasing ageing population owing to increased life expectancy and reduced mortality will drive industry growth. Presence of favorable government policy will further boost device uptake. For instance, in December 2015, the Brazilian Health Ministry issued a decree as per which unilateral and bilateral implants would be financed for all age groups along with follow-up and hearing therapy. Cochlear implant systems industry is consolidated with presence of few players such as Cochlear, Sonova, William Demant and MED-EL. The manufacturers are engaged in rigorous research and development activities aimed at improving hearing outcomes and expanding indications for these implantable solutions. The industry participants employ strategies such as collaboration, acquisition, new product de0velopment and expansion of manufacturing capacity for increasing their market presence. For instance, in July 2017, Cochlear Limited invested approximately USD 50 million for developing a new manufacturing facility in China. The move will enable the company to strengthen its industry position in China and other emerging market and will also help to achieve an increase of 50 percent in its global production capacity. The manufacturers also strive to stimulate the industry growth through programs aimed at increasing the awareness of hearing loss. Cochlear implants are the most successful neural prosthesis for facilitating functional hearing in the case of individuals afflicted with severe to profound sensorineural hearing loss. However, the market is largely untapped as very few CI candidates are presently using the technology. The adoption of these devices is higher in developed economies as compared to developing ones owing to greater awareness levels, higher per capita healthcare expenditure and access to advanced healthcare infrastructure. Delay in hearing loss diagnosis owing to inadequate infrastructure, lack of new born screening programs and unavailability of skilled audiologists and surgeons impedes distribution and use of these devices in developing countries.